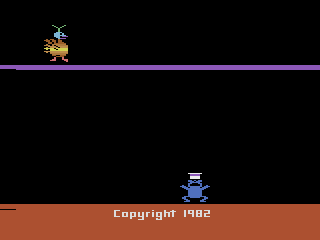 The Atari 2600's library was full of similarly themed games (a nice way of saying clones), and if Eggomania looks more than a little bit familiar it's because you've seen it before. 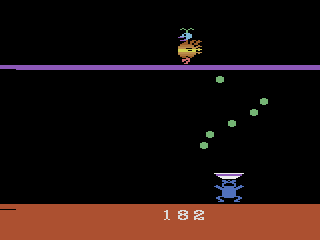 Eggomania is nothing more than a Kaboom clone (which itself was a rip-off of Atari's Avalanche), but at least its a well done clone. Kaboom by any other name is still Kaboom. This time instead of the Mad Bomber you have a wacky looking bird, instead of the Bucket Brigade you have a bear with a bowl on its head, and instead of bombs you have eggs. Right... The object of the game is still the same though, you must catch all the eggs the bird drops or drown in a pool of yoke (yummy!). However Eggomania has a twist, after successfully catching a round of eggs you get to throw them back at the bird! If you can successfully hit the bird with a direct shot you get to see a very upset looking bird fly away and award you some bonus points. While it may be nothing new, at least Eggomania offers a little more than the standard rip-off. Unfortunately the ability to turn the tables on your enemy isn't enough to make up for its annoying flaws. Unlike Kaboom which gave you three layers to catch the bomb before it hit the ground, Eggomania only gives you one layer before it counts as a miss. Also hurting Eggomania is the fact that the action never really gets fast and furious like Kaboom, but for some of the less coordinated gamers out there this may be a godsend. In the end Eggomania is nothing more than an average entry in the 2600 library. 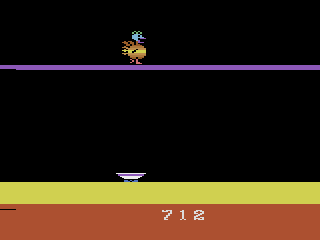 Interestingly a mockup screenshot of the game in some early ads shows a second level with another bird on it above the player. 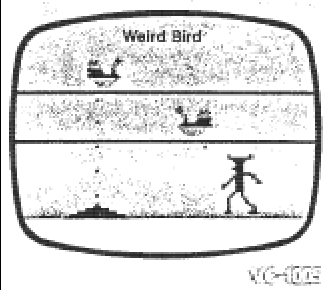 It is unknown if a version with two birds was developed or if it was simply a miscommunication with the artist.